A few weeks back, I mentioned that I had an energy audit performed on my family's home and discussed some of the issues found by that process. 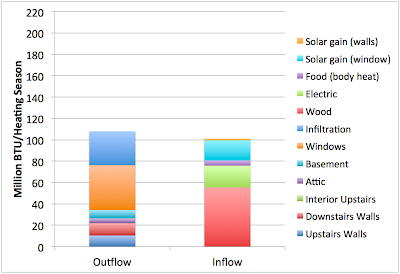 Then yesterday I presented a simple energy balance model for the house. Today I want to continue the story by discussing a model for what the house might look like after the $19k (give or take) in energy upgrades that we are discussing with our energy efficiency contractor (Snug Planet). The losses through the walls. These were already modest and it would be very expensive to improve them further by removing the siding, adding rigid foam, moving windows etc outwards, and then residing the house. Thus no upgrade work on the walls has been proposed by Snug Planet. This will make more sense to do when the siding is nearing the end of its life. The conductance losses through the windows. The house has forty windows and thus replacing them all with good quality modern windows would be very expensive and likely not pay for itself any time soon. To be honest, I also feel some resistance to pulling out 150 year old windows that still work and look like they could last another 150 years. Assuming that a good job is done of sealing off the tops of the interior upstairs walls with rigid foam as proposed, then the interior walls should no longer be a heat leak and that term disappears altogether. Additional insulation will be blown into the attic to bring it to R-45 and it is straightforward to calculate the effects of that using the same procedure as yesterday. Once the basement is air sealed the air down there should stratify and allow relatively little downward heat transport. I modeled this by assuming the basement floor acquires an effective R15. Finally, I assume that infiltration is cut from a blower door measurement of 5155cfm@50Pa to 1800cfm@50Pa. At this point, I do not have a firm target for this from Snug Planet, and so the 1800 is a conjecture based on the results of another energy retrofit of an older house in my area where the windows weren't replaced. The next question is how the inputs will change in response. 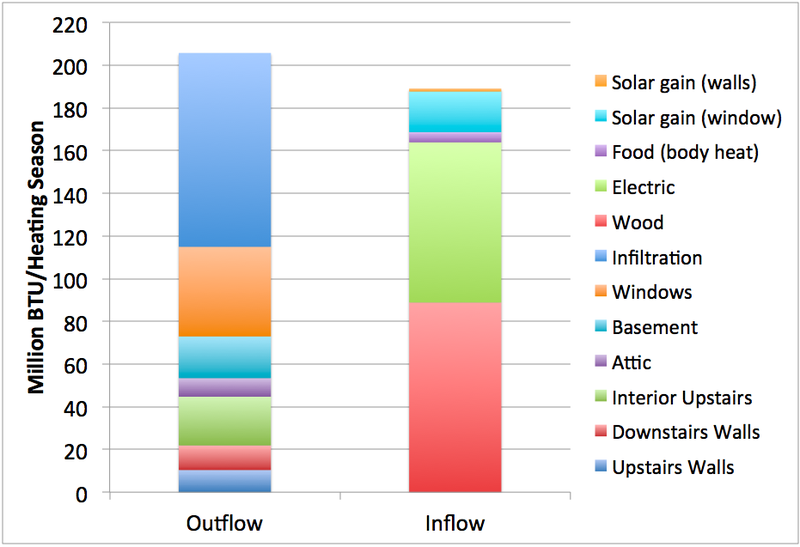 My first assumption is that the electricity usage of the house during the winter will fall to 80% of the summer level - this is somewhat of a guesstimate based on replacing the heaviest energy using appliances and figuring that usage of the baseboard electrical heat could be eliminated. The other terms (solar gain etc) are unchanged. So then the firewood usage would fall from 3 1/4 cords to 2 cords. Under these assumptions, and with a 15 year 3% on-bill recovery loan, in the first year, we would pay $1570 in loan payments but save $2165 in energy costs. Obviously, the exact numbers are sensitive to final project cost and what does or doesn't go into the project. But the larger point is that this project does have the potential to work as advertised: we would save $500 in the first year and the amount of saving would (on average) increase in each following year as inflation increased energy prices but not our loan payment. Finally after fifteen years the loan would be fully paid off and we'd just have energy bills half as large as they would otherwise have been. One interesting aside I wanted to make: in our case we rely on wood and renewable electricity so this operation will not really save fossil fuel emissions. However, if instead we were using our standard utility electricity offering and natural gas or coal, then this would reduce the operational carbon emissions of our house by a factor of two, and cost negative money. Since I'm sure our house is not atypical in this regard, I think this raises questions about the pricing of carbon offsets. 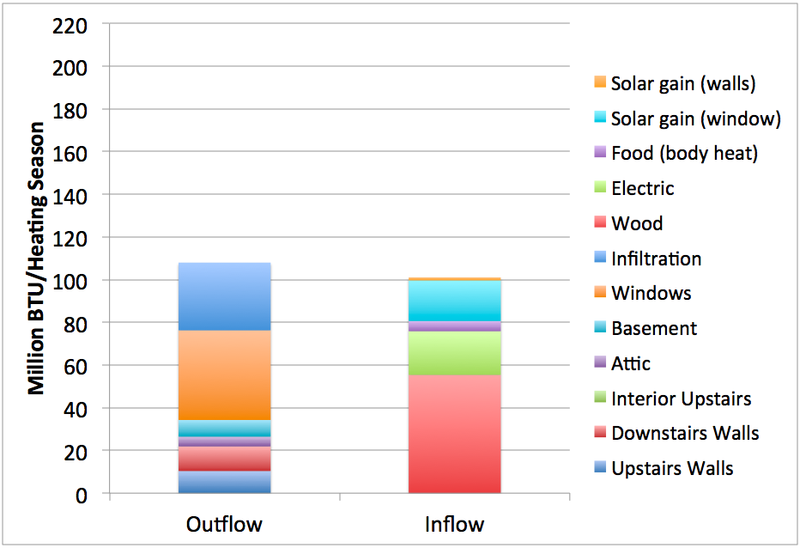 Infiltration is the largest single energy loss at present, and so the project economics are very sensitive to the final blower door number. It's critical that we not do all the expensive stuff in the attic and basement but then neglect to do the small fixes required to get the infiltration number down. I'm going to be looking to get a commitment ahead of time as to what the final blower door number will be and who is doing what to achieve that. We currently pay $7.50/Mbtu for wood heat, but $35/Mbtu for electric baseboard heat. So the project economics are also very sensitive to how much we reduce electric usage versus wood usage. This in turn requires giving some more thought to how to distribute the wood heat around the house. Right now we keep the downstairs at about 75F and air movement keeps the upstairs at about 65 during the day, which with the baseboard thermostats set to 60 keeps the electric heat off except for at night. With less air movement in the house, we probably need some additional measures to allow convection to move heat upstairs. There are two places in the ground floor ceiling where square holes in the paneling have been patched. I suspect these were holes with grates over them that were the Victorian solution to this problem. I may open them up again. My assumptions about heat loss to the basement depend on the idea that there won't be much air movement down there. If the dehumidifier or heat-pump water heater stir up the air a lot, this may not be true. Finally, while the specifics of my house may not apply to the reader, it's worth repeating: if you haven't had an energy audit done in the last decade or two, there may very well be a lot of value in doing so. Stuart, a silly question: you have looked into temporary double glazing, right? I don't recall you mentioning it. It would help with infiltration as well as conductance through the windows. It's possible to make up some tidy-looking units (heat-shrink film stretched over both sides of a 19mm frame, with draught-stop foam on the outside of two sides, and two small tabs to ease fitting and removal in the casement frames) that can be stored in your (now drier and cleaner) basement for the summer months. It might be possible to clear the spouse approval hurdle with a little care in design. I found optically clear plexiglass (acrylic) sheeting to be excellent. This is ideal for use to cover your old windows. The sheeting is fixed using swivel "turn-turret" plastic mountings. The mountings surround the window every 14" or so, and have a lug which is turned over / presses on the edge of the sheet. Beneath the sheet (next to the window paint surface) I put foam strip draft excluder. Press the sheet down, the draft excluder deforms to the window surface and swivel the retaining lug over. This gives a air-tight seal, and by swivelling the mounts back the sheet can be removed for cleaning. Usually the sheet is cut to the dimensions to fit your window - here in the UK I was getting sheeting cut to exact size with 1/2 mm (almost 1/64th inch) tolerance. Measure up right! The difference to the room was amazing. 2 big plastic sheets cost me £80 (about $130), are invisible as soon as you step back - and I would say give 90% + benefit of new double glazed windows. Suddenly the room was silent, too. Been up for 6 years with no problems at all, no discolouration. Looks perfect. Easy to put up (watch out for sharp cut edges though). Excellent suggestions gentlemen - in the distant past when I was a graduate student I made wooden frames with thin plastic sheeting to cover the single pane windows in the winter. The plastic looked like hell and definitely wouldn't pass the spousal approval bar now. However, rigid acrylic or polycarb in neat frames might pass muster. 40 windows would be a big project though - probably need some kind of commercial solution given the small amount of time I have after job/family/blog. I should remention (it was in the original post on the audit) that previous owners had installed triple-track aluminum-frame storm windows outside almost all the original Victorian casements. So that probably halves the conduction loss. The resulting assemblage is still clearly drafty though - it doesn't work that great at preventing infiltration. Stuart, I noticed that you don't discuss comfort level, but only the objectively measurable parameters. 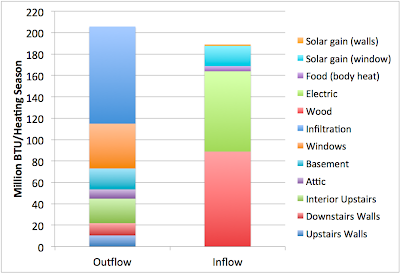 From my experience in beefing up insulation in a ca.1900 Victorian style house in Asheville, NC I realized that the benefits of the retrofitting divide somewhat between the amount less needed to heat and the increased comfort level. IOW you might not realize as much savings as calculated from the model, but realize greater comfort level. We had ~65 degrees in our house during the winter both before and after insulating but it felt warmer after the walls were insulated because we weren't radiating our body heat to the cool walls. Thinking about embodied energy of the materials used to construct buildings confirms the architects' principle of long-lasting improvements making sense beyond the immediate "payback" in operating cost.